One listener wanted to know: “What’s the true story behind the Hunters Point Crane?” We sent a reporter from our collaborative reporting project Hey Area to find out. EDITOR'S NOTE: A previous version of this article inaccurately stated that the crane could lift approximately 28 warships; the crane could actually lift 630 tons — a fraction of the weight of a single warship. The Hunters Point gantry crane has been in San Francisco since 1947, when it was known as the mightiest crane in the world. It’s also eye-level from Craig Peterson’s fourth-floor office window. My first inclination was to learn more about the crane’s history from the vast pool of Bay Area historians. That’s where I found Chris Carlsson, co-director of FoundSF.org, who says that what Peterson was told is partly true — the Hunters Point crane was indeed the mightiest in the world at the time. But as for the crane as a prize claimed after WWII: “I can’t even remotely believe that that has any veracity,” Carlsson told me. Before we get into that, let’s get to know this crane better. The Hunters Point gantry crane is 450 feet high — that’s about 150 feet taller than the Statue of Liberty. It is 730 feet long; only about 150 feet shorter than the Titanic. The crane was built after Pearl Harbor was bombed. The Navy took over the Hunters Point dry docks, which had been there since the 1860s. They used the dry docks as a space drained of water to allow the inspection and repair of ships’ hulls. Hunters Point was the first permanent dry dock on the West Coast. After expanding in 1916, it was considered to be the largest dry dock in the world. Chris says the crane was constructed in the late 1940s to maintain battleships known as the Pacific Fleet. The crane could reportedly lift 630 tons; that’s approximately 28 warships. The Hunters Point shipyard was decommissioned in 1974, and the massive crane has stood idle ever since. Carlsson believes that there’s no way the crane could be German because of how massive the American steel industry was at the time. But Craig Peterson is still not convinced. “Is it theoretically possible that it was actually fabricated and installed in Germany and as reparations after the war, was disassembled, brought to the United States?” he wonders. To find the definitive answer, I made a call to our nation’s capital, and spoke to Paul Taylor, the branch head for communication at the Naval History and Heritage Command. 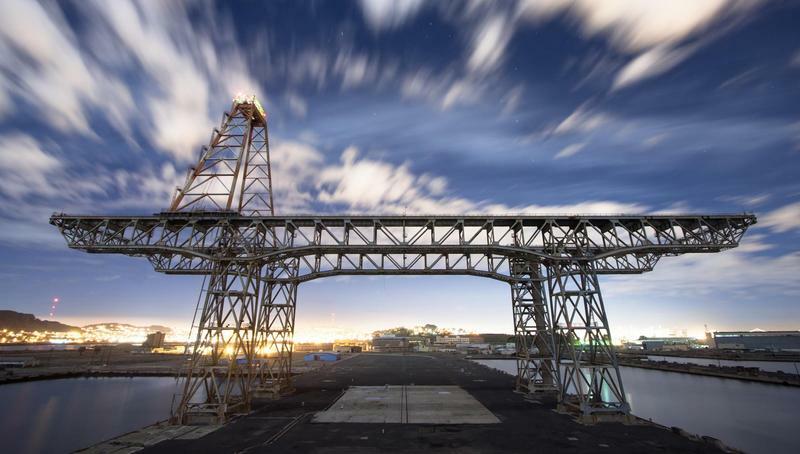 Herman was brought from Germany and reassembled in the United States at Long Beach, California, at about the same time as the Hunters Point gantry crane was built. So, the Hunters Point crane was definitely made in the United States. I visited Craig once again, and we stood in his office, looking at the crane as I gave him the news.